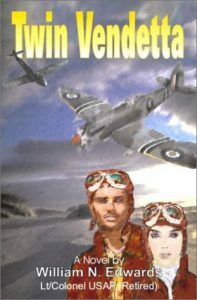 Colonel William Edwards’ Twin Vendetta is a fast-paced tale that moves from the fall of France in World War II to Allied military operations in North Africa, Sicily and Italy, then to clandestine intelligence activities behind enemy lines in France and Germany. It is the story of a young French/Canadian woman’s insurmountable problems in avenging the strafing death of her twin brother by the German Luftwaffe. And it brings out the secret thoughts of a young American man who has taken up the call-to-arms to salve guilt feelings that have overwhelmed him by his German father’s Nazi activities. The protagonists complement one another as a “two-man” team of Spitfire fighter pilots in combat against German Messerschmitt fighter planes in support of Allied ground operations. Colonel Edwards highlights some of the most profound fighter and fighter-bomber combat of World War II in the Allied war effort against Hitler’s military forces in North Africa, Sicily and Italy. It is also the story of her bittersweet first love with them both fearing the revelation of their innermost thoughts and identities. She is finally unmasked during treatment for near-fatal wounds, then learns of his secret life when they travel together to war-time Germany on a critical espionage mission. This novel challenges the author’s story-telling gift from beginning to end, and he is up to the challenge.